Life is filled with disappointments. People disappoint us. We disappoint ourselves. Circumstances disappoint us. The question isn’t: “Will disappointments come, but how do we respond in the midst of our disappointments. When we view God in the midst of our disappointments, the disappointment will become a means of a greater love and appreciation for our Great God. Here are twenty truths to remember in the midst of our disappointments. A doctor’s waiting room is not a pleasant place. Yes, there are comfortable chairs, a TV, and magazines. However, somebody is sitting in the office waiting for test results that will bring bad news. Another person is waiting for a procedure that may or may not work. Another person is fidgeting because they are growing very impatient. Another person is anxious because they don’t know how they will pay their large medical bills. Another person looks completely bored as they continually look at the clock. God’s waiting room is much like a doctor’s waiting room. As we wait upon God, fear and anxiety can creep into our lives. We don’t know what plans God has for us. For this reason, we worry about our future. We are filled with pain, whether it be physical, emotional or spiritual. We wonder how long must I continue with this pain. We can become upset with God because He is keeping us in His waiting room longer than we would like. God’s waiting room is one of the most difficult places for a believer. We want God to come and relieve us of our fear and anxiety quickly. We want God to change our lives now and make us a super Christian. We get tired of the daily drudgery of our lives. The pain is constant and no relief is in sight. We feel like we are drowning and coming up for air one last time, and God’s hand is not there to pull us out. David had some of these feelings throughout his life. He faced a lengthy time of persecution by King Saul. He struggled with his own guilt over his sin with Bathsheba. 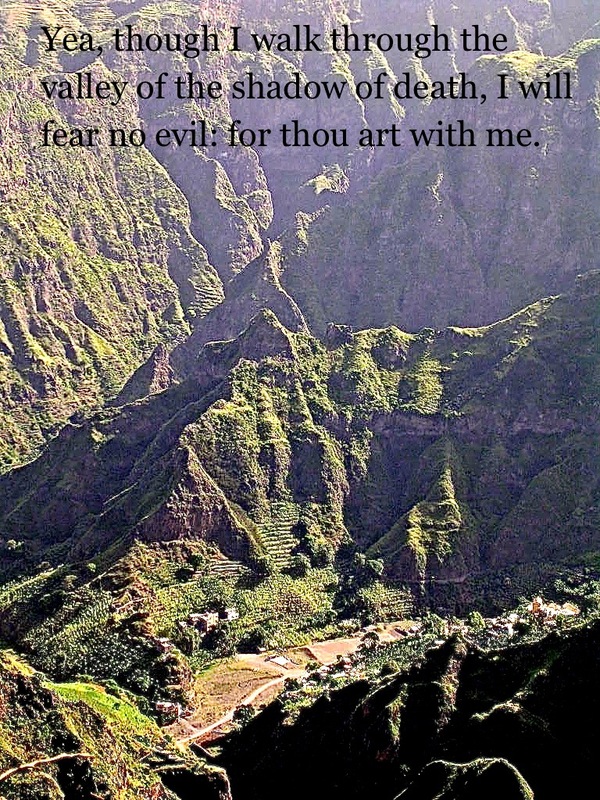 He faced many other fearful, anxious and painful situations. How did David respond to being in God’s waiting room? Psalm 40 helps us to join David in God’s waiting room. David understood that there are times in life in which we must spend time in God’s waiting room. In David’s case, it was a deep pit from which he couldn’t escape. God often makes us wait so that He can teach us some very important lessons about ourselves and His person. He makes us wait because it is part of His perfect plan for our lives. God’s waiting room is also a place to teach us faith and patience. God in His timing will take us out of His waiting room and respond to our cries. God heard David’s cry and took him out of the pit and placed him upon the solid rock. God gave David the grace to continue serving Him and ministering to others. Likewise, our waiting room experience will enable us to have a greater capacity to serve the Lord and minister to others. We will have learned the art of dependence upon God in the waiting room. The greatest blessing of being in God’s waiting room is to share our experience with others. David’s experience caused him to give praise unto God. When people saw David’s response to God’s working in his life, they learned the lesson of trust for their own lives. They understood that if God was with David in the waiting room, He will also be with me. John Bunyan spent several years in the Bedford jail. His crime was that he preached the gospel of Jesus Christ. While in jail, Bunyan produced one of the greatest Christian books ever written, called “The Pilgrim’s Progress.” Even today, many people have been blessed by John Bunyan’s waiting room experience. Like Bunyan, God will give us a message to share with others while we are in His waiting room. It may not be a book, but it will be a message about God’s faithfulness, love and deliverance. Faith means that no matter what happens in my life, God is in control and He will ultimately use it for His glory and the benefit of others. 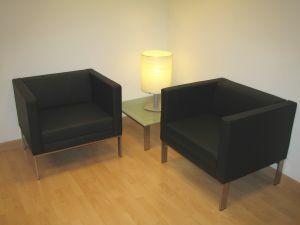 Today, if you feel as though you would like to escape God’s waiting room, don’t! God is right there with you in the waiting room though you may not see Him working or understand what He is doing. The waiting room is a place of patience and faith. God’s timing is not always our timing, but it is the best timing. When I read this account, God convicted me about my life. I had always read these words with the understanding that we are to pay our taxes, but I never paid much attention to the second part of Jesus’ statement. God wants me to give all things unto Him because I belong to Him. One question that comes to my mind: “Have I rendered unto God the things that belong to Him?” I realize that my answer is “no”. I still am dealing with selfishness in several areas of my life. I often don’t recognize in my heart that belonging to God means I surrender every area of my life to Him. Surrender is the true essence of defining what it means to be a servant (bond-slave) of Jesus Christ. My reputation is an area in my life that I need to give unto God. It is difficult not to defend oneself when others may not agree with you or even worse when they oppose you or try to tear you down. Jesus Christ is the great example of one who surrendered His reputation to His Heavenly Father. God’s reputation is more important than my reputation. A second area of my life that I need to render to God is my family. Marriage can easily bring out my selfish bent. Instead of looking at my wife in the same way as Christ loved the church. I seek to please myself. A marriage surrendered to God demonstrates a selfless love that seeks the best for one’s spouse. Also, I am grateful for the three children that God has given to us. Our two sons are serving the Lord in Portugal and our daughter and her husband are making plans to minister in England. When we give our children unto God, it is difficult when the Lord takes them to distant place to live. This is a great reminder that our children ultimately belong to God. They are his gift to us to raise them to honor and glorify Him. Almost every day, the Lord reminds me of some area of my life that I need to surrender to Him. He is my Lord and Master. He knows what is best for me. What keeps me from surrendering every area to my Loving Lord? (1 Corinthians 15:58) Every time I read this verse, I can’t help but think of my Father-in-Law, Perry Mayton. He lived out this verse in his daily life before his family, and every person who knew him. Perry Mayton was born January 3, 1919 in the small city of Harriman, Tennessee. God was preparing Perry’s heart to serve Him through two tragic events in his childhood. His dad died when he was six years old and his mom died when he was a teen. These tragic events would help give Perry a compassionate heart as he ministered to people throughout his life. Harriman was a city filled with gospel preaching churches. As a result, Perry accepted the Lord as his Savior during his teenage years. For a few years he didn’t grow in his faith, but God was preparing him for future ministry. After leaving the army, Perry began working in one of the mills in Harriman. During that time, he met his future bride Iva Olmstead. In 1948, they married. Soon after the wedding, Perry believed that the Lord had called him into the ministry. 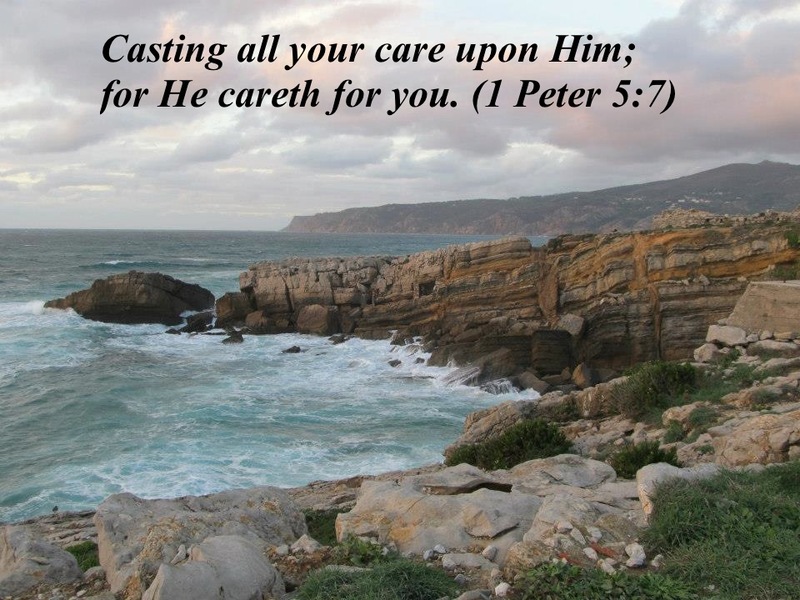 He demonstrated this calling by his faithfulness in serving the Lord for over fifty years. There are several things that stand out in Perry’s life and ministry. One thing that always impressed me was his tireless service for the Lord. During most of the years of his ministry, Perry also had to work a day job. This meant that he would work all day and then take on the demands of a pastor during the evening and Sunday. I never heard him complain because he found great joy and peace in serving the Lord. Perry also had a compassionate heart towards others. He showed concern for any person in need. He had a special compassion for the lost. A few times, I would go with Perry when he did his weekly radio broadcast. His passion for the lost was clearly seen as he would plead for the lost to repent of their sin and turn to the Lord as their Savior. He had the unique gift of having both the heart of an evangelist and a pastor. The fourth thing that impressed me about Perry was his great spirit of humility before God and others. I never heard him talk about any of his accomplishments. He did God’s work and didn’t think about the praise of men. He sought to please God alone. This humility was obvious to any person who had Perry as their pastor. The greatest impact that Perry had upon my life was through his daughter, Sharon. Perry did a great job of preparing his daughter for being a wife and mother. Sharon understands to this day what it means to minister in a local church. Her father also taught her how to love the Word of God and minister to people with a heart of compassion. Perry was quite well-known in the Harriman area because he had been the pastor of several local churches. I never heard anybody say a bad thing about “Brother Perry”. He was beloved by the people in his churches and he loved them. He would continue to minister via the radio and preaching in churches until his health kept him from doing what he always loved. On September 1, 2003, Perry would enter into the presence of His Savior. The funeral visitation was a great testimony to his over fifty years of ministry. The line to greet Perry’s widow, Iva, went outside of the doors of the funeral home. Many people told us how God had used Perry in their lives. The outpouring of love was a testimony to Perry’s faithfulness in his service to the Lord. Yes, Perry is missed by his family, friends and many of those to whom he ministered; however, his testimony lives on in the lives of many people. The words of Matthew 25:23 apply to the life of Perry Mayton. “His lord said unto him, Well done, good and faithful servant;” Perry has finished his labors here on earth, but his legacy lives on through his family and many others who were blessed by his ministry. “I can’t forgive them.” “What they did to me is unforgivable.” “I won’t ever speak to them again.” ” I can’t forget how much they hurt me.” What do all these statements have in common? They show an individual who has a bitter spirit. God gives us three reasons to cast out bitterness and embrace forgiveness. 1. Christ has forgiven us. 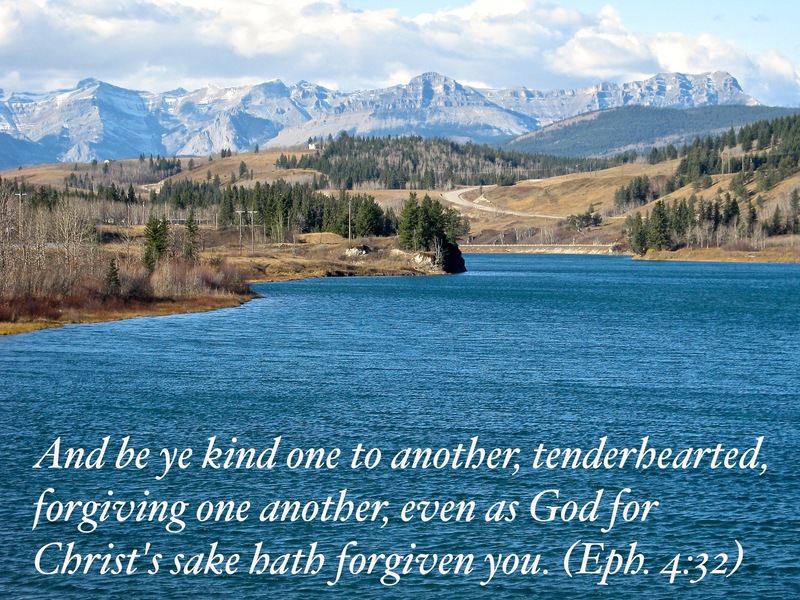 “And be ye kind one to another, tenderhearted, forgiving one another, even as God for Christ’s sake hath forgiven you.” (Ephesians 4:32) No matter what anybody has done to us, it is nothing compared to all of our sinful offenses towards God. The Parable of the Unforgiving Servant is a great illustration of the above truth. The landowner forgives his servant an enormous debt; yet this forgiven debtor is unwilling to forgive his follow servant a very small debt. (Matthew 18:21-35) How can we talk about God’s mercy and not share that mercy with others? 2. Christ commands us to forgive others. “Forbearing one another, and forgiving one another, if any man have a quarrel against any: even as Christ forgave you, so also do ye.“(Colossians 3:13) A bitter spirit is a disobedient spirit. When we forgive a person in our heart, we are walking in obedience to Christ. 3. Christ is our example of demonstrating forgiveness. When Christ was being mocked upon the cross, He didn’t respond with anger and bitterness. He called out to His Father: “Father, forgive them; for they know not what they do.” (Luke 23:34) When we forgive those who have hurt us, we are acting like our Savior. These people didn’t ask Christ to forgive them, but yet Christ poured out His forgiveness towards them. Forgiveness is difficult for us because we think that the offended party is “let off the hook”. In reality, we are let off the hook. We are now free to live our lives without being controlled by our bitterness. God shows us the following blessings of extending forgiveness to others. Forgiveness is our choice. We can continue to feel hurt and embittered, or we can choose forgiveness. The offending party may never ask for forgiveness, but we can forgive them in our heart. Many persons have lived a miserable life because they chose not to forgive someone. Is your bitterness worth it? NOTE: This is the sixth post in the series “Moving Beyond”. Please check out the other posts in this series. Grant had entered our lives in 1984. He came to the church in Hillbrow as a result of being invited by a temporary secretary at the law office where he was working. At first, his attendance was rather sporadic, but he soon accepted the Lord Jesus Christ as His Saviour. As time went by, Grant became very involved in various church ministries. He had a great love for the people in Hillbrow, especially the children. He would faithfully do door to door visitation, and he ministered in the Awana Club Ministry. He also became an excellent preacher of the Word. After we left South Africa, Grant attended Bible College. In 1999 we visited South Africa and stayed with Grant for a couple of weeks. We had some terrific talks. During that time, the Hillbrow church ordained Grant for the Gospel ministry. I never heard a person do so well in an ordination council. Grant, by this time, decided to leave his full-time work as a lawyer and only work part-time. His desire was to give as much time to the Lord’s service as possible as the Assistant Pastor of the Hillbrow Independent Baptist Church. Though Grant is in the presence of the Lord, he is greatly missed by many people in Johannesburg. Here was one person who selflessly gave his life for those around him. During the aftermath of Grant’s death, the young people in the Hillbrow church were challenged to fill the shoes that Grant had left behind. One of the young people responded: “His shoes are too big for us to fill.” Though many in this world never knew Grant, he was truly a man greatly used of God.